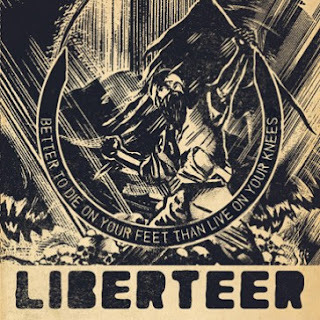 Liberteer is the singular vision and execution of Matthew Widener. BTDOYFTLOYN is a politically charged grind album the likes of which you have never heard before. BTD is incendiary in its entirety as it stokes the fires of rebellion. Cutting through the vicious grind are horns and pipes to remind us that this is about war. Civil war. But a new kind of civil war. Not a geographical or religious war. This is a war against the centralization of wealth and power. Us vs, Them. A rallying cry for The 98%. And just as much so a war against complacency. Riffs and themes circle around and are ever present, holding the album together as it threatens to unravel under the force of its own fury. BTD is compellingly powerful and those horns can make a patriot out of anyone. The album is unique, uncompromising and unrepentant. It's insightful and inciting, and quite possibly the most meaningful album of the year. BTD will punch you in the face and grind you under its boot and you'll pop right back up with a "Thank you sir may I have another!!"